We joined Volkswagen New Zealand at Bracu in the Bombay Hills. On a stunningly clear day, this olive vineyard was the perfect location for the launch of the 2018 Touareg. 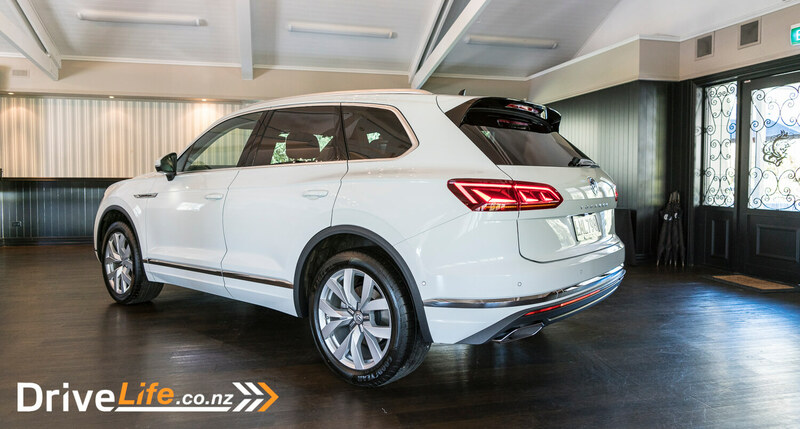 Tom Ruddenklau, General Manager for Volkswagen New Zealand, started the launch with a general state of the nation with some stats on sales and the future products for New Zealand. There has been huge growth from VW between 2009 to 2018, which Tom said is starting to plateau. This more than likely due to the market saturation of SUV’s. 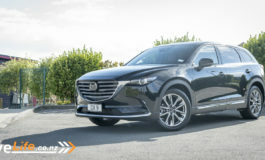 The market in New Zealand as of mid-2018 is split up as passenger vehicles at around 27% with 21,000 units. SUVs take up the largest section of the market at 42%, around 32,000 units. The Ute segment is rapidly growing due to the V6 Amarok at 38%, which is 20,200 units. The remaining 7% is commercial vans and 4,100 units. “This year, we were not prepared for the consumer reaction to the new Tiguan and struggled with stock to meet the demand. This has left VW down 4% of over last year’s sales,” says Tom. He was confident that the second half of the year to be huge for VW with the large supply for Tiguan available and all new Touareg. The new Touareg is going up against the heavy hitters of the large SUV market; Land Rover Discovery, Range Rover Sport, Volvo XC90, X5 and Q7. The new Touareg will focus on the large SUV market, which is currently 56% of the SUV market, mid-size now has the Tiguan All Space at 15% and the small SUV market at 9% with the standard Tiguan. Tom also let us in on a new product that will be hitting our sources later in the year. The New T-Roc R-Line arriving in September will help to complete the SUV family that VW offers. They will start with one spec, an R-Line at $51,990 with a 2.0-litre, 140kW TSi, which we will hopefully get a chance to drive later in the year. 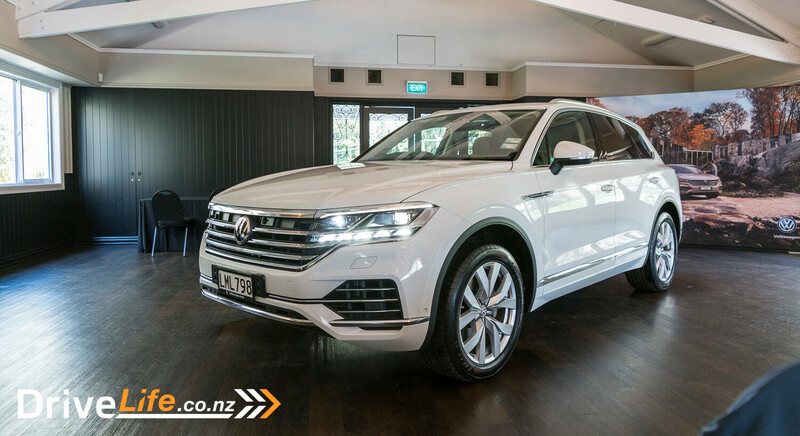 The 3rd generation flagship Touareg was introduced to us by Rasika Verleijen, Volkswagen New Zealand Product Manager. There will be two models available immediately; the TDI V6 and the TDI V6 S. The TDI V6 starts at $96,990 and comes with a 3.0L diesel-turbo with 170kW of power and produces 500Nm of torque. The TDI V6 S starts at $107,990 and comes with the same 3.0L diesel engine. The S creates 210kW and 600Nm of torque. They will also offer a V8 R-line variant which will become available in 2019. Built on the MLB platform which is shared with the Audi Q7, Bentley Bentayga and Porsche Cayenne, the new Touareg will be 77mm longer and 44m wider than the second generation model. However, in the flesh, the older model’s design seemed bigger than the new model. 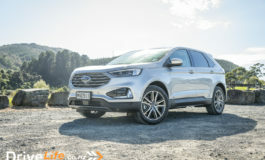 With a new refined, premium and clever interior, and massive tech improvements, they hope to achieve a target of 10% of the New Zealand large SUV market. 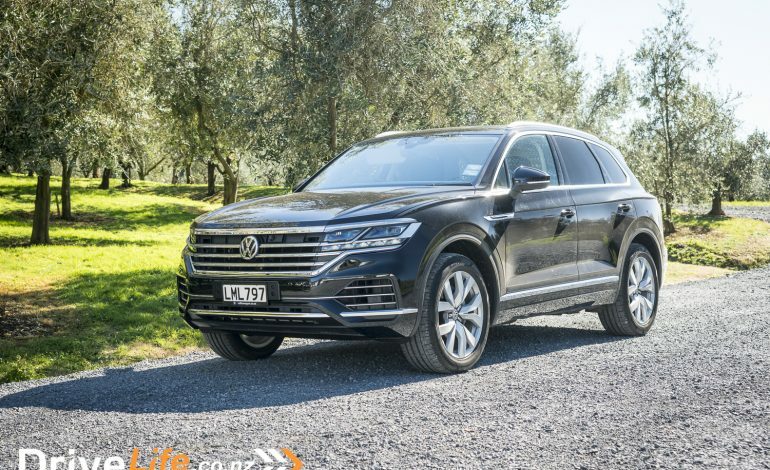 And even though VW is still trying to move past the dark shadow of the global diesel issues, they believe that the new Touareg defines success, in an understated way, much like great New Zealanders. There have been significant changes to the new Touareg which were covered under 4 main headings: Design, Performance & Driving, Advanced Safety, and Infotainment & Interior. Design: the exterior of the new Touareg has had a dramatic style change, following in the modern, sleek footsteps of the latest Tiguan. Performance & Driving: this covered the two new engines that were offered. Standard on the S but optional on the V6, the new model offers air suspension and an electromechanical anti-roll bar stabilisation system. The air suspension allows the diver to lift the car, providing an extra 70mm clearance, and can also be lowered 15mm when in sports mode. The electromechanical active roll bars aid in reducing the side lean when cornering in such a large vehicle. As standard, the Touareg now comes with all-wheel steering, which at low speeds increases the agility and manoeuvrability while also providing a reduced turning circle to 11.1m. Advanced Safety has seen a lot of technology upgrades from the previous model, starting with class-leading LED Matrix headlights, which have 128 LEDs per headlight, active high beam assist and active cornering lights. These are standard on the V6 S but optional on the V6. All models come with a Monitoring Cross Traffic feature, which works at junctions and exists to help with poor visibility and minimise accidents. For larger vehicles, features like this are very handy. Informatainment and Interior showcased the new Innovisison cockpit with a 15-inch touchscreen that wraps towards the driver and a 12.3” TFT active info display in the driver’s dash. This is standard in V6 S and optional in the V6. The other new feature is the optional ambient interior lighting which offers you a range of up to 30 colours. The Touareg is available in 8 different colours; Two whites, silver, blue, gold, brown, black, and grey. There are also two interior trim options; Raven (light brown) and Soul (dark grey). Once the briefing had finished it was time to see what the new Touareg was like to drive. There were only two Touaregs in the country, both V6 S models, howev,er neither of which had the air suspension or electromechanical active roll bars. 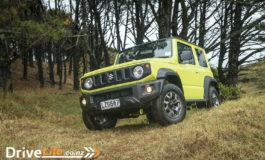 These two will be the only two in New Zealand without them as they are pre-production models, and once stock arrives they will have both of these options as standard. Behind the wheel of the new Touareg you feel very at home if you are an existing VW customer. For what is a large vehicle, it does not feel big nor does it feel heavy and cumbersome to control. If I am being honest, it almost feels just like the smaller Tiguan to handle. On the back roads of the Bombay Hills, the Touareg handled very well for its size, which made me excited to eventually test a V6 S with the air suspension and active roll bars. The engine in the V6 S was the 210kW, 3.0L single turbo-diesel. This engine produces 600Nm of torque and its linked to the 4-Motion all-wheel-drive system by an 8-speed tiptronic gearbox. The power delivery was nice, it did not feel like 600Nm when taking it slow out of corners, but once you got over 2500 rpm the power curve became a lot more noticeable. At speed and in sports mode the engine was very responsive and predictable, leaving the driver feeling confident about the road ahead. The new Innovision cockpit envelopes the driver with two massive screens. A 15inch central screen and a 12-inch driver display. Both of these display a huge amount of information for the driver and passenger. It’s not too dissimilar to an iPad. It has windows that can be edited to display different information, and in these windows, you can swipe left and right to see additional information. This system allows you to edit all the major aspect of the vehicle, which can even be done by the passenger while the driver is focused on the road ahead. As this was a taste test we only had a short time to play with it. I imagine we could spend a few hours looking through all the menus and configurable options available. We look forward to having a more in-depth look at this in a full review. The new Touareg goes on sale next month, and it will be an interesting one to watch. It’s obvious that the V6 S is the best value for money, however, this is just over the $100k which may be a big divider for some. That and the fact it’s a 5-seater in a predominately 7-seat SUV market could mean it’s a bit of a struggle for some to justify. 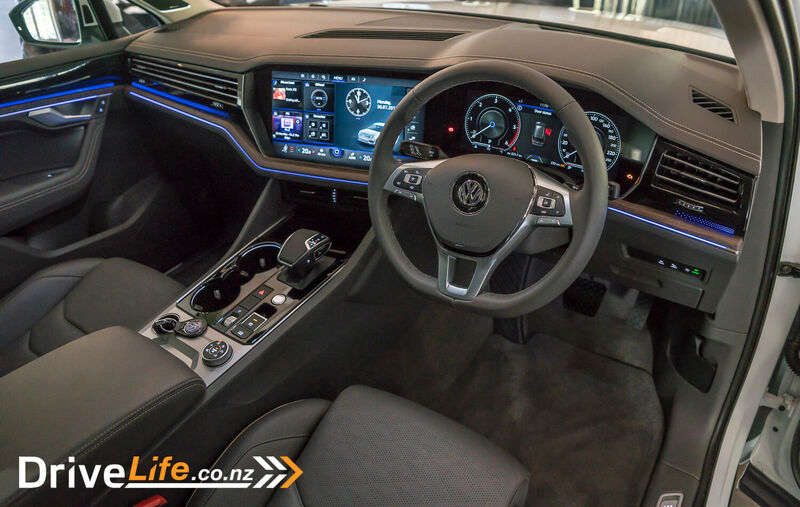 I think it will do well in New Zealand as VW has shown great advancement in lifestyle technology, which is a big attraction for many of today’s buyers. We will be keen to get the new Touareg for a more in-depth review later in the year.